The Gorkha Janmukti Morcha has decided to redesign its flag which in the past 10 years has been used with different symbols, the latest being those featuring party chief Bimal Gurung's portrait. 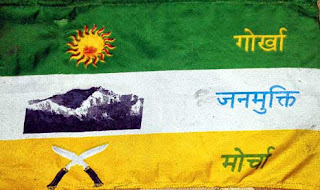 Although the originalMorcha flag unfurled on October 7, 2007, had yellow, white and green colours along with the party's name inscribed on the right and three symbols -a rising sun, mountain and khukuri - on the left, for the past two years Gurung and some senior party leaders have handed over party flags with Gurung's picture in several programmes. Such flags have also been used by several Morcha activists in many events, drawing criticism by Opposition parties like the Gorkha National Liberation Front, which had termed it "privatisation of the flag". Morcha sources said Gurung has called a meeting at Malidhura in Darjeeling on December 27 at 11am to discuss the flag issue. "The design of the new party flag has more or less been finalised. It will be discussed at the meeting. There is a possibility that the new flag will be unfurled after the meeting," said a party source. According to Morcha insiders, Gurung's picture would not be there on the new flag. "The colours will probably remain the same but the placement of the symbols which are on the right hand side of the flag is likely to be changed. Discussion on every aspect of the flag will take place at the meeting. Gurung's picture would not be put on the flag," said a source. "It seems that Bimal Gurung has been told by religious people that he follows that the flag needs to be changed slightly," he said. "Apart from the flag change issue, two other agendas would be discussed at the December 27 meeting. One is discussion on issues related to panchayat and civic polls and the other agenda is to place a report on the recent dharna and meeting with the Union home minister, Rajnath Singh, in Delhi," said the source.